Acknowledging the folk influences that have always been apparent in his music, Andrew Robson has composed new music for 8 English and Scottish folk ballads for which the music was lost long ago, re-imagining them for the new millennium. To help him realise this new work, Robson invited Mara and Llew Kiek and Steve Elphick, with whom he worked regularly in the Mara! group 1996-2010 (and occasionally since) to come together in a collaboration that showcases what happens when music is no longer constrained by concerns of style or category. 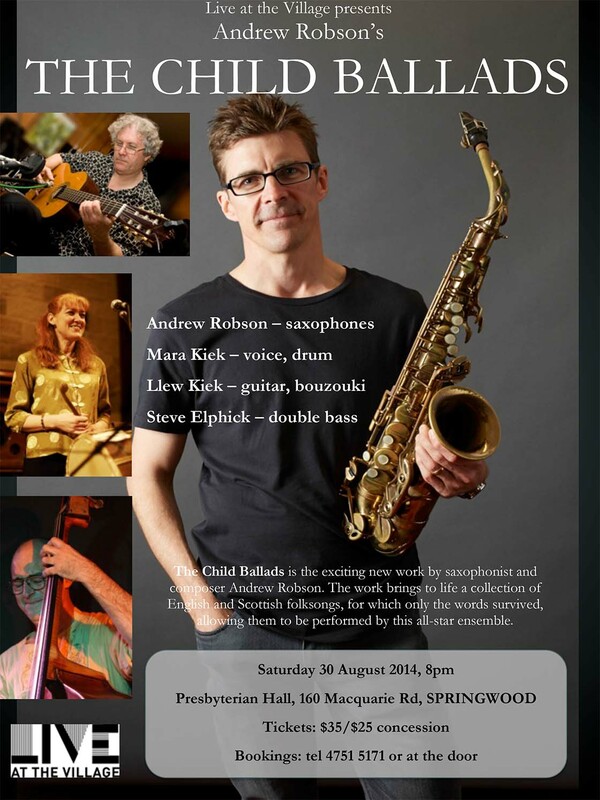 Andrew’s background is firmly anchored to the jazz tradition and having made a name for himself in the 1990s working with the bands of Jackie Orszaczky, Robson is now recognised as one of our most distinctive improvisers and composers. In addition to leading his own groups, he is also known for his work with Trombonist James Greening, the Paul Grabowsky Sextet and the legendary Australian group Ten Part Invention, stepping in for the great Bernie McGann after his retirement. The Child Ballads is a work almost beyond classification, drawing as it does on ancient folk tales of love, lust, treachery and murder, all set to Robson’s sublime new melodies and performed by this all-star ensemble. Performed for Live at the Village, at the Django Bar, the Seymour Centre for SIMA and Blue Mountains Music Festival, The Child Ballads is now released on CD, recorded with Ross A'Hearn at the Music Workshop at Sydney Conservatorium of Music.